Davide Livermore’s production of Puccini’s La bohème returns to the Academy of Music for the f irst time since 2012. Photo by Kelly & Massa. Onstage Publications, Advertising: 937-424-0529 | 866-503-1966, korlowski@onstagepublications.com | onstagepublications.com This program is published in association with Onstage Publications, 1612 Prossser Avenue, Kettering, OH 45409. This program may not be reproduced in whole or in part without written permission from the publisher. JBI Publishing is a division of Onstage Publications, Inc. Contents © 2019. All rights reserved. Printed in the U.S.A.
From the BOARD OF DIRECTORS Dear Friends, I want to brag on Opera Philadelphia’s upcoming 2019-2020 season. But first, let me acknowledge the debts our production of La bohème owes to other Philadelphia cultural institutions and to the people who make them run. This production of La bohème, which originated here in 2012 and has since been presented in five different cities in the United States and Europe, evokes the Paris of 1896 using paintings that, when Puccini composed the opera, were regarded as beyond avant-garde. Because Dr. Albert Barnes and other Philadelphia collectors were early adopters of impressionism and post-impressionism, and because the staffs of the Philadelphia Museum of Art and the Barnes Foundation, then led by Timothy Rub (PMA) and Derek Gillman (Barnes), worked hard to obtain for Opera Philadelphia the rights to use images of the works, many of the images featured in the production come from those two museums. As we revisit the production, we salute Mr. Rub and PMA’s Board Chair, Leslie Anne Miller; Executive Director Thom Collins of the Barnes and Joseph Neubauer, its Chair; along with the many others who drive these organizations forward. Bryan Hymel, Rodolfo in the 2012 production, and 2012 cast member Jeremy Milner trained at Philadelphia’s Academy of Vocal Arts—as did Vanessa Vasquez, our 2019 Mimì. Evan LeRoy Johnson, our Rodolfo this time, and Ashley Marie Robillard (Musetta) trained at the Curtis Institute of Music. They could do that because of AVA founder Helen Corning Warden and Curtis founder Mary Louise Curtis Bok, and because teachers and administrators grew and sustained these world-renowned voice programs. Thanks to President K. James McDowell and Music Director Christofer Macatsoris at AVA and its chair Rick Pitcairn, President & CEO Roberto Díaz at Curtis, and Curtis Board Chair Mark Rubenstein. My heartfelt congratulations go to Mikael Eliasen, who, after leading Curtis’ vocal studies program for so many years, is taking on increased responsibility as an artistic adviser to Opera Philadelphia. As Danielle Orlando and Eric Owens take over from Mikael, and as Bryan Hymel settles into his role as AVA Vice President, we look forward to seeing many more representatives of these schools on our stages. Finally, we’re sitting in the Academy of Music thanks to the leadership of President & CEO Anne Ewers and Kimmel Center Board Chair Teresa Bryce Bazemore, who were supporters of this season’s Festival O18 and continue to be tremendous partners. All those kudos leave only a little room to highlight Opera Philadelphia’s 2019-2020 season, which is Maestro Corrado Rovaris’ twentieth with the company. So, I will direct you to pages 35-37 of this program, where our upcoming season is detailed. Of course all of this—the extraordinary season that comes to an end with La bohème and the can’t-wait-for-it season that starts in September—is designed and built by Opera Philadelphia’s own inimitable staff and is brought to you by our many donors, without whom our stage would go dark. I hope you will join them and me in supporting your opera company, and I thank you for your continued enthusiasm and patronage of Opera Philadelphia. From the GENERAL DIRECTOR Dear Friends, It is so fitting to conclude this momentous 2018-2019 Season with a beloved revival of Puccini’s La bohème. The artistic leadership at Opera Philadelphia, featuring myself and Jack Mulroney Music Director Corrado Rovaris along with Vice President of Artistic Operations David Levy, Artistic Administrator Michael Eberhard, New Works Administrator Sarah Williams, and artistic advisors Mikael Eliasen and Lawrence Brownlee, have a great love and respect for the operatic canon. At this time last season, we all gathered for a new production of Bizet’s Carmen that brought a fresh vitality to the Academy stage through director Paul Curran’s vision and an important company debut of tenor Evan LeRoy Johnson as Don José. That excitement for “the classics” is again evident in Davide Livermore’s production of La bohème, which first graced our stage in 2012 and has since enjoyed an international tour and become a staple of the Palau de les Arts “Reina Sofía” in Valencia, Spain. The incredible collections from the Barnes Foundation and the Philadelphia Museum of Art provide a rich patina that combines with the lush melodies of Puccini to create new interactions with both art forms. Evan is back with us as Rodolfo opposite the marvelous soprano Vanessa Vasquez in her company debut as Mimì. While the set and costume designs show off the treasured artworks of the museums, these two talented young singers show off two other Philadelphia institutions, the Curtis Institute of Music (where Evan trained) and the Academy of Vocal Arts, where Vanessa recently completed a fouryear residency. They are joined by an amazing cast of singers including Troy Cook as Marcello, Opera Philadelphia Emerging Artist Ashley Marie Robillard as Musetta, Will Liverman as Schaunard and Peixin Chen as Colline, and Kevin Burdette in the roles of of Benoit and Alcindoro. It is truly an honor to bring these artists together with the creative talents of the Opera Philadelphia Orchestra and Chorus and the Philadelphia Boys and Girls Choirs, in a production that celebrates this incredible art form and our city. Thank all of you for joining us for this performance and for your continued support of opera in Philadelphia. THE ANNUAL NUMBER OF HEART ATTACKS COULD TAKE YOUR BREATH AWAY. SO COULD JUST ONE HEART ATTACK. Shortness of breath and difficulty breathing are just two warning signs of a heart attack. Call 911 if you experience any warning sign. Learn the other signs at americanheart.org or call us at 1-800-AHA-USA1. Â© 2002, American Heart Association. Act III Several weeks later, the ailing Mimì seeks out Marcello at the tavern where he is now employed as a mural painter. She tells him that she is afraid Rodolfo’s jealousy will drive them apart. As she starts to leave, Rodolfo comes out of the tavern and Mimì quickly hides. After some prodding from Marcello, Rodolfo admits that his jealous fits hide his real feelings of despair over Mimì’s increasingly serious illness. A coughing fit reveals Mimì’s presence just as Marcello, hearing Musetta’s raucous laughter, rushes back into the tavern to investigate. Mimì tells Rodolfo that they should separate and the lovers exchange memories of their happiness. Marcello and Musetta come out of the tavern in the midst of a heated argument. The two exchange insults and part angrily, while Rodolfo and Mimì agree to stay together until spring. commiserate over their loneliness. Colline and Schaunard enter, breaking the mood and offering a small meal. They are interrupted when Musetta arrives with the news that Mimì is outside, very ill, and has asked to be brought to Rodolfo. While Rodolfo helps Mimì lie down, Musetta gives her earrings to Marcello, telling him to go buy medicine and send for a doctor. She runs out to buy a muff for Mimì’s cold hands and Colline leaves to sell his coat to get more money. Left alone, Rodolfo and Mimì reminisce about their first meeting and the love that they shared. Soon the others return, bearing medicine and a muff to warm Mimì’s hands. As Mimì succumbs to her illness, it is obvious to everyone but Rodolfo that the help has come too late. He is the last to realize that Mimì has died and he falls on her lifeless body calling her name. The running time of La bohème is approximately 2 hours and 45 minutes including two 20-minute intermissions. La bohème PROGRAM NOTE As the orchestra plays the first notes of La bohème, the painting of a seascape on a wall of the set emerges into full blue-green color. Suddenly the wave crashes, tossing a spray of white brushstrokes to the swell of the music. When director and designer Davide Livermore conceived of this production in 2012, he chose to set the opera in the time it was written. The Impressionist art of the time became the inspiration for the sets and costumes of La bohème. Rather than a garret, the bohemians would inhabit an abandoned art salon. The paintings on the walls – masterworks by Van Gogh, Renoir, Pissarro – become the work of Marcello, a starving artist who happens to be creating some of the most popular paintings of all time in front of a live audience through the magic of video animation. “In this world that Davide created, the paintings become a character unto themselves,” said David Levy, Vice President of Artistic Operations. The dedication to detail took time, and all of the pieces didn’t come together until opening night. “It took forever to download,” Levy said, as it took a dedicated computer to transmit all the files from across the Atlantic. FACILITIES A Commitment to Safety: The safety and comfort of visitors, artists, volunteers, and staff at the Kimmel Center, Academy of Music, and Merriam Theater are of paramount importance. In the event of an emergency, audience members will be advised of appropriate procedures by ushers and security staff. At this time, please take note of the exit nearest you. A red, illuminated EXIT sign should be visible, with an arrow indicating the direction of the exit door. Should an emergency arise, you will be directed to leave the auditorium and further instructions will be provided as to the safest and quickest way to exit the building. Patrons who need special assistance should contact an usher. Smoking is prohibited on the Kimmel Center campus. Accessibility: The Academy of Music is wheelchair accessible from the east lobby entrance on Broad Street. Seating is available on the Parquet and Balcony levels, with accessible restrooms located on the Canteen level. Assistive listening devices are available for loan. A limited number of ADA-compliant parking spaces are available in the Kimmel Center garage. Coat Check & Restrooms: A complimentary coat check is located on the ground floor of the Academy of Music. Restrooms are located on all levels of the Academy of Music. Food and Beverage: Concessions by Chef Jose Garces and Garces Group are available to Academy of Music and Merriam patrons at satellite bars located in the lobbies and upper levels. Water fountains are located on all levels of the Academy of Music. GIVE T O D AY that will make all the difference tomorrow? unsung, and potential is unrealized. But your generosity kindles a passion for opera so powerful, it reverberates down Philadelphiaâ&#x20AC;&#x2122;s Avenue of the Arts, through every city block. Opera Philadelphia gratefully acknowledges the individuals and institutions whose support allows us to stage our groundbreaking festival and seasonal lineup, and to share programs that encourage civic dialogue and enhance arts education. With you the show will go on. 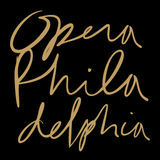 For more information, contact Eva James Toia, Director of Major Gifts, at 215.893.5906 or etoia@operaphila.org. You complete the Picture of Giving. Members of the General Director’s Council play a pivotal role in the future of Opera Philadelphia. Council members may align their support with areas of special interest, such as sponsoring Emerging Artists, supporting community programming that furthers arts education, or funding Opera Philadelphia’s innovative new works. For more information, contact Rebecca Ackerman, Director of Individual Giving and Advancement Services, at 215.893.5904 or ackerman@operaphila.org. The Patron Program is comprised of committed opera enthusiasts whose collective generosity provides vital support for Opera Philadelphia’s productions and community programs. Patrons enjoy access to VIP benefits in the opera house including champagne intermission receptions and a VIP coat check, as well as invitations to exclusive events throughout the season, and priority ticketing services. Mr. Jay H. Tolson Victory Foundation Laura A. Williamson Mr. Robert Zimet $3,500–$4,999 Mr. and Mrs. Jeff Bohn Joan and Frederick Cohen Mr. and Mrs. William A. Graham, IV Bruce and Robin Herndon Ian Kirschemann and Leslie Jones Terri and Thomas Klein Anne Silvers Lee and Wynn Lee Laurie Wagman In memory of Irvin J. Borowsky Carol A. Westfall $2,500-$3,499 Anonymous Drs. Ronald D. and Marcia Abraham Brett and Nan Altman Lydia Alvarez In memory of Isabelle Ferguson Mr. and Mrs. Paul Anderson Eileen Baird Beaty Bock and Jonathan Miller Mr. Michael F. Cade and Mr. Mayron Lizardo Lopez Ruiz Drs. Judith and Jeffrey Carpenter Dr. Frank Craparo Ms. Joan DeJean Tobey and Mark Dichter Mark Duckett and Stan Gaddy Ellis A. Gimbel Charitable Trust Mr. and Mrs. Joseph P. Fanelli, Jr. Invitations to member-only recitals and lectures And much more! For more information, contact Guest Services at 215.732.8400 or membership@operaphila.org. C OR P O R ATE CO U NC IL The Corporate Council generously supports Opera Philadelphia’s artistic and educational programming through contributions and in-kind donations. For more information about sponsorship opportunities, EITC contributions, or to join Opera Philadelphia’s Corporate Council, contact Derren A. Mangum, Director of Institutional Giving, at 215.893.5924 or mangum@operaphila.org. HOW W I L L Y O U B E R E M EM B ER ED? There are many ways you can help Opera Philadelphia now and in the future. If the Opera has played a significant role in your life, we encourage you to ensure our future by making a gift to Opera Philadelphia in your will or estate plan and joining our Legato Society. Informing us of your intentions allows us to recognize your generosity today as well as plan for the future. To join or to receive more information, contact Rebecca Ackerman, Director of Individual Giving and Advancement Services, at 215.893.5904 or ackerman@operaphila.org. A few years ago, Dianne and I, along with our son, Bryce, saw John Adams conduct his opera Nixon in China. Since its 1987 premiere, “Nixon” has been one of my favorites, in a pantheon of works by composers ranging from Monteverdi to Mozart to Mazzoli. We three, however, do not favor the same operas or composers: at that “Nixon” performance, I loved the production, Dianne loved the dancing, and Bryce was “grateful for the experience.” Will our grandchildren enjoy the works of John Adams? I don’t know. But I don’t care to worry about it. The history of opera is littered with forgotten works praised at their premiere and others belittled at their birthing which are now critically acclaimed box office bonanzas. What I do care about is that our children and grandchildren have a choice of operas to love for their beauty and power, or for their dancing—or just for the experience. That requires supporting the creation and production of opera both now and in the future, to ensure this art form is continuously enriched with a blending of the old and new, the traditional and iconoclastic, the comfortable and discomfiting. This is what Opera Philadelphia does so well—and the reason Dianne and I support it with our giving now and include the company in our estate plans. All operas share in common the fact that not one of them would be seen or heard if they were funded only by ticket sales. We are very grateful to everyone who joins us in giving to make opera a reality right here in Philadelphia. And for the experiences your generosity makes possible—for all of us now, and later for all of our grandchildren. T H E LOVE FOR THREE OR A N G E S September 20-29, 2019 | Academy of Music A longtime favorite of Jack Mulroney Music Director Corrado Rovaris, this musical gem is rarely performed in the United States even though it originally premiered in Chicago in 1921. It’s a fun, fantastical farce, combining opulent stage design, a kingdom of colorful characters, and some of composer Sergei Prokofiev's most energetic, accessible music. The Love for Three Oranges, a seriously funny opera about a melancholic prince and his cursed quest for love, makes its Opera Philadelphia premiere as part of Festival O19 in a “masterful new production” (Opera News) by South African director Alessandro Talevi. The cast features a wonderful blend of returning favorites and debuting singers. The “agile, fresh-voiced tenor” (Opera News) Jonathan Johnson makes his company debut as the melancholy prince, with soprano Wendy Bryn Harmer, who is featured in the Metropolitan Opera’s DVD recordings of The Magic Flute and Ring cycle, as Fata Morgana, the witch who curses him. Bass Scott Conner brings “sonorous command” (Cleveland Plain-Dealer) to the King of Clubs, the prince’s father; tenor Barry Banks, who boasts “the same combination of tonal sweetness and pinging clarity that made Pavarotti famous” (Telegraph, UK), portrays Truffaldino, the court jester. Based on a play by Carlos Gozzi, Prokofiev’s Returning are bass-baritone Zachary opera is best known for its iconic “March.” Altman and bass Brent Michael Smith, Thanks to its playful satire and a “score who delighted as two of the Mechanicals [that] bubbles with invention and high in February’s A Midsummer Night’s Dream, spirits” (Gramophone), the opera has been a while baritone Will Liverman, currently European staple for almost a century. on stage as Schaunard in La bohème, comes back to the Academy as Pantalone, Talevi’s production “turned out to be the the king’s trusted advisor. real highlight” (Opera News) of Florence’s Maggio Musicale, where it debuted in Prokofiev is perhaps best known for Peter 2014. Featuring an elaborate, trompe l’oeil and the Wolf and his ballet Romeo and proscenium arch and oranges reminiscent Juliet. Don’t miss this rare opportunity to of Fabergé eggs, in Talevi’s hands experience the composer’s operatic triumph. Prokofiev’s comic gem becomes grand opera with a Russian twist. T H I S I S T E N S I O N . T H I S I S A R T. T H I S I S A N E W S E A S O N O F O P E R A . For personalized assistance curating your Opera Philadelphia experience, contact Guest Services at 215.732.8400 or visit operaphila.org. 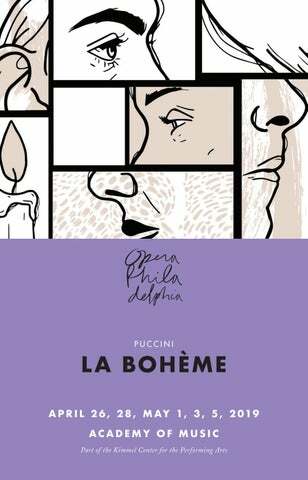 Performance program for LA BOHEME, at the Academy of Music April 26 – May 5, 2019.